Unbelievable footage emerged from Navan, Ireland yesterday, as a man - now identified as Conditional rider Evan Daly, appeared to be running around the track in the middle of a horse race. Daly has been cautioned by stewards after he was nearly struck by the field in the back straight, and only avoided the fast-approaching horses after last-minute shouts from the riders made him swerve out of the way. The Conditional rider was oblivious to the Grade 3 seven-runner race going on, as he was listening to music on his headphones whilst warming up in preparation for a ride later on the card. 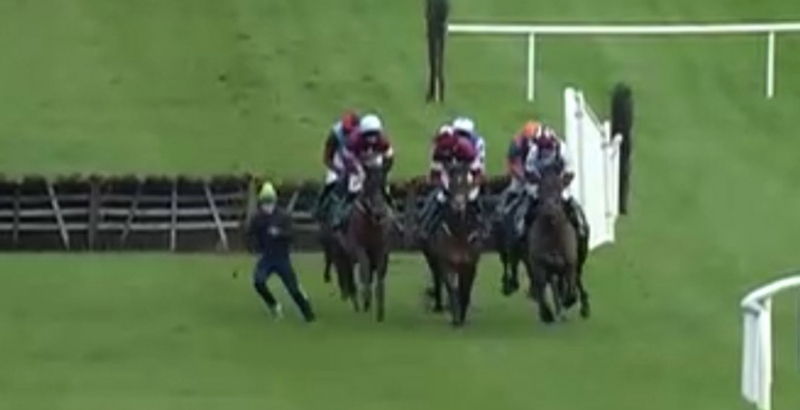 Michael O'Donoghue, a steward on duty at Navan on Sunday, said: "Evan has been cautioned. He was very embarrassed about the whole incident. “He was listening to his music, and only heard the shouts at the last minute before jumping out of the way." The 2m Grade 3 contest was eventually won by the Willie Mullins-trained Aramon, who on Sunday was best priced as 33-1 for the opening race at the Cheltenham Festival; the Supreme Novices' Hurdle.